After my first experience with TBRindr and G. R. Matthews, I was quite looking forward to revisiting both. 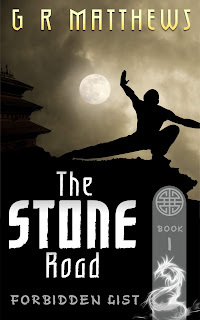 I was also curious to see how The Stone Road would compare, seeing as the last book from G. R. Matthews was very firmly in the science-fiction genre, whereas this looked to be closer to the Wuxia genre. Something so different in tone, I wanted to see how he pulled it off. War has raged between the city states of Wubei and Yaart for thirty years, and a delegation from Wubei has been summoned to try and broker peace. For two men, the treaty will be an important turning point in their lives. 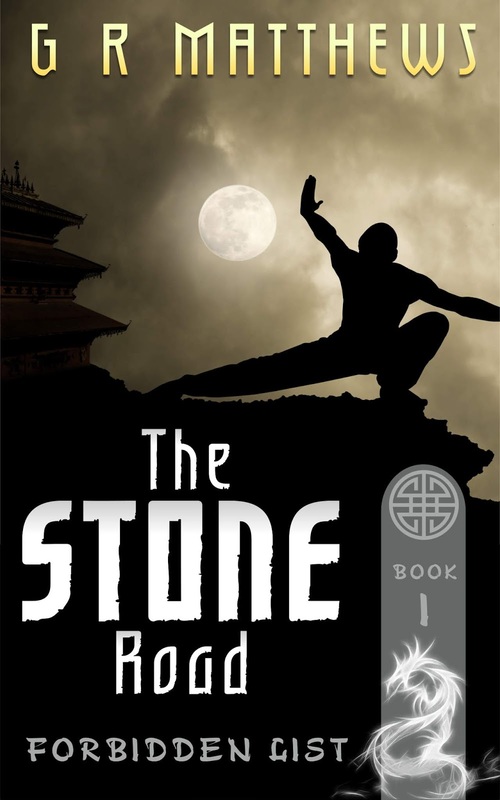 From Wubei is Zhou, a junior diplomat who is desperate to forge peace by any means, both for personal advancement and to ensure that his infant son can grow up never needing to fight and die for his homeland. From Yaart is Huang, a soldier who has just been recruited into the Jiin-Wei, an elite group of soldiers, magicians and spies, and has been given his own orders about how to influence the negotiations. I really liked The Stone Road, more than I was expecting. Wuxia is a genre that has long fascinated me, but I've never really known where to start with it. While this is probably not a proper example of the genre, it's close enough given the circumstances. So let's start with the good points of The Stone Road. First, there are the two main characters, Zhou and Huang. On the one hand you have Zhou, who is largely well-intentioned, but stubborn and opinionated enough that he seems to make enemies wherever he goes, while Huang is a lot more realistic about his place amongst his superiors, but is beginning to experience doubt and guilt about what he must do to protect his home and family. On balance, I do prefer Huang as he seems more prepared for everything that transpires, but there are a lot of parallels between the two men that I would be fascinated to see develop in later books. Second, there was the plot itself. While I won't go into spoilers, I will say that The Stone Road covered a lot more than I was expecting when I first started it. The diplomacy part covers only a fraction of the novel, and the rest is several months' worth of fallout from its conclusion. With such a big scope, there is the risk that the narrative could get a bit winding and self-indulgent, but Matthews manages to keep it tight and punchy throughout. There were a couple things that bugged me a little, but they're not huge issues in and of themselves. The first is that unfortunately in my copy there were a couple of editing flubs, the most egregious being a word missing from the end of a sentence, that kind of highlighted that it was a debut independent novel; much as I am a firm believer that indie novels are something to keep an eye on, it's the sort of mistake that would be ironed out by a professional editor. Not enough to make me want to stop reading, but it does disrupt the immersion somewhat. The second thing that bugged me was the magic system described in The Stone Road. Magic is introduced pretty early on via the Fang-shi, a group of what are essentially court magicians, who seem to be able to channel innate magical capabilities via talismans and symbols. So far, so good. A bit vague, but it had enough structure to please me. Then about halfway into the novel, people called Wu are introduced, who have some kind of strong link to their animal counterpart in the spirit world and can call upon this spirit to enhance their abilities and cast other magic. With that, I am now confused about how the two are meant to co-exist. Are they tapping into the same power source, or are they totally separate? If they are tapping into the same power source, why bother with Fang-shi when the Wu seem to be so much more useful? I suppose that there will be more explanation into this as the books continue, but it does sort of bother me, having two apparently incompatible systems of magic in the same place and time.